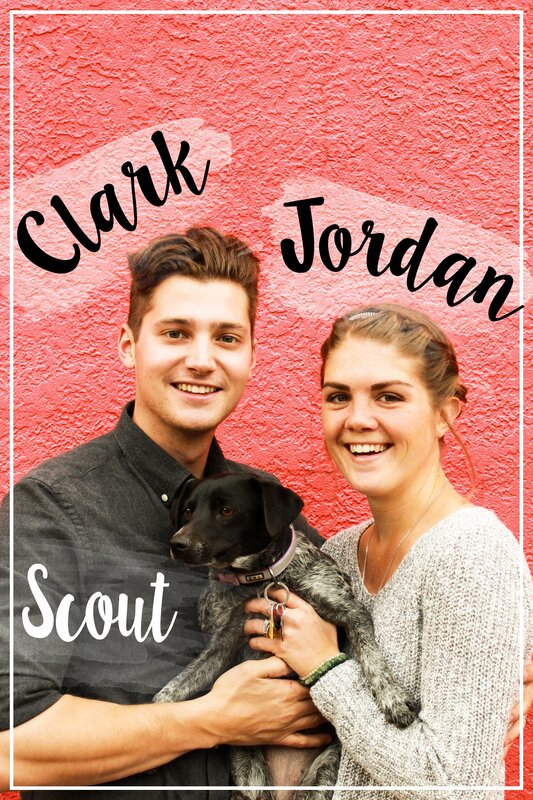 Hey guys, it’s Clark sharing the recipe today! I offered to write the post for this new drink because bourbon brings back some nostalgia from those good ol’ college years. Back when I thought it was so cool to drink Kentucky straight bourbon with no chaser… And I’m not talking about the good stuff, either! Needless to say, those days are long gone and my palette is a bit more refined. Now, if I’m drinking whisky, it’s going to be in a delicious drink like this one. For this recipe I wanted a proper bourbon with that classic Kentucky taste, and one that would provide a higher-proof kick to this sweet, maple-tasting drink. After perusing over 100 varieties at Astor Wine and Liquors in SoHo, I decided on Elijah Craig’s 12-year small batch bourbon. This smooth, 94-proof liquor has caramel notes and a light oaky flavor. It’s known as “the world’s greatest small batch bourbon,” and for good reason. Properly aged, small batch, true Kentucky bourbon? Sold. This is the perfect November/December cocktail. Make this for your friends and family at Thanksgiving dinner and they’ll love you forever. Or a least until their glasses are empty! Because it can be prepared solely in your blender, this is an ideal large batch drink. 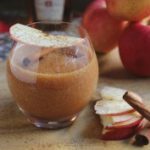 Adjust the quantities accordingly and serve in a highball glass with a large ice cube, cinnamon stick, and a slice of apple. We picked up a couple of these square silicon ice cube trays on Amazon. Best $8.50 I’ve spent in a long time. The huge cubes melt much slower, which keeps your drink from being watered down. I highly recommend giving this drink a shot at your Thanksgiving dinner! It’s the perfect marriage of a manly bourbon cocktail with a bit of sweetness for all those whisky haters. [I know you’re out there.] It’s made of simple ingredients and it’s easy to make. 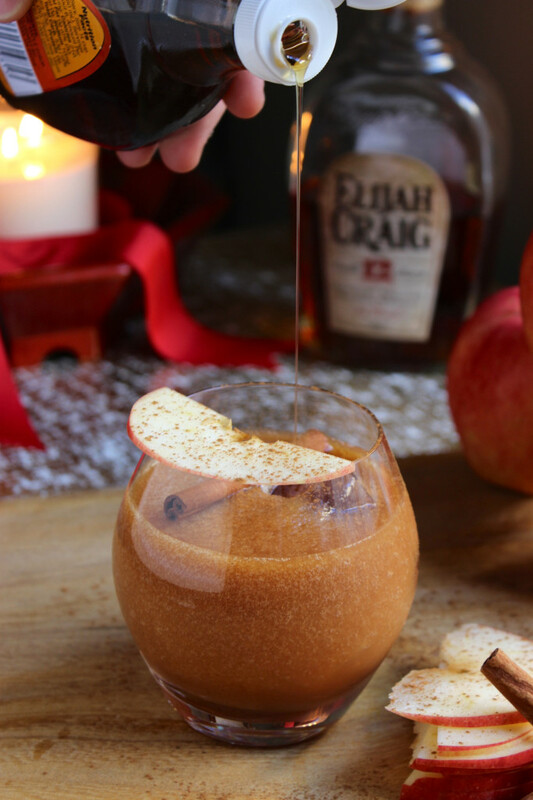 Just apples, lemon, maple syrup, cinnamon, and bourbon – no nonsense. If you want to include the youngsters, just leave out the bourbon. It’s a special treat and they will love the taste just as much as the adults. Always remember to drink responsibly and never drink and drive. 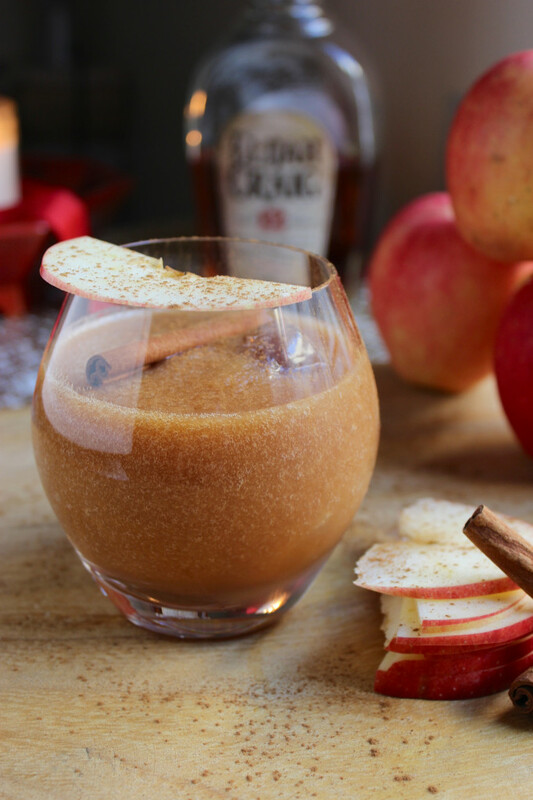 Cinnamon, maple, and apple complement warm layers of bourbon in this cozy fall cocktail. Core, peel, and quarter an apple. Add to blender and puree. 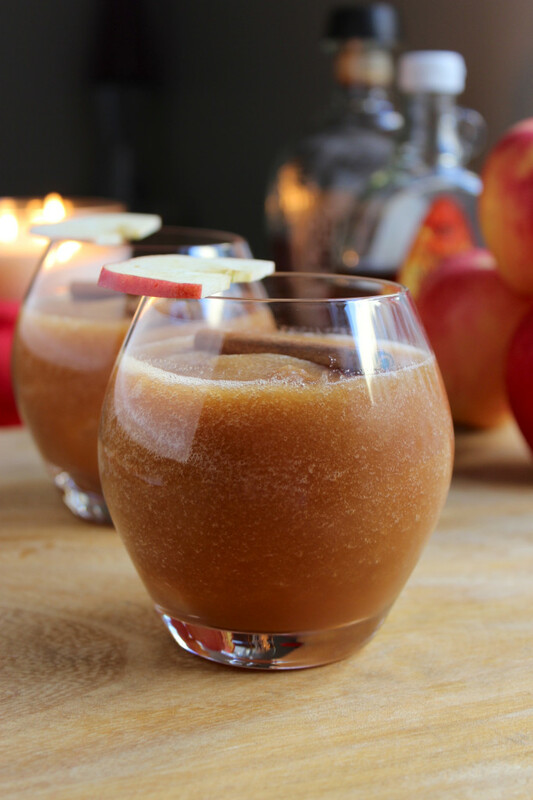 In the blender with the apple puree, add bourbon, lemon juice, maple syrup, and cinnamon and pulse to combine. 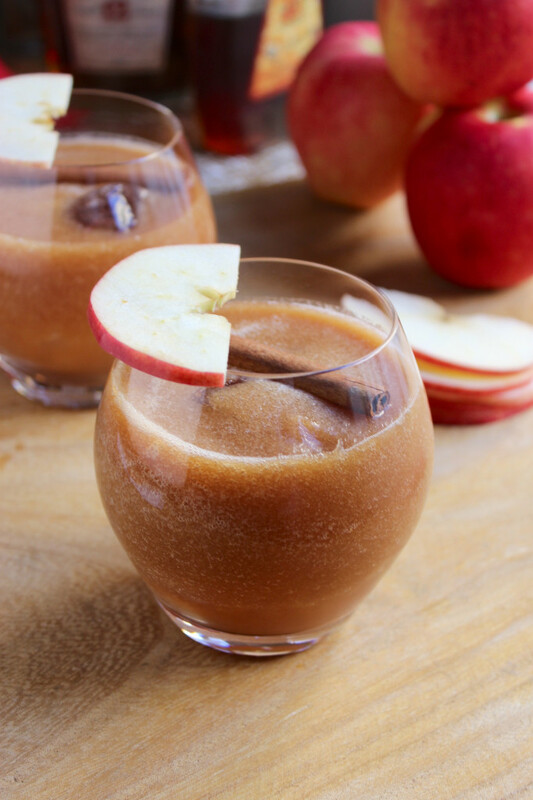 Pour over ice into a glass and garnish with an apple slice or cinnamon, as desired. Hi, I was wondering how much cinnamon goes into the blender? Hi Bobby – Just a dash will do! Less than 1/8 teaspoon. When did you add the bourbon? your recipe for the boozy maple orchard isn’t listed. Can you please post again or email it to me.